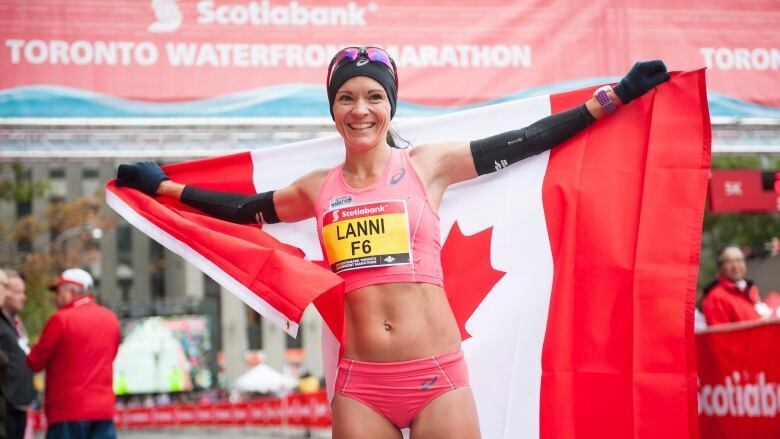 In early June, Lanni Marchant got a phone call from Athletics Canada’s head coach, essentially telling her to forget about running the marathon in Rio. Lanni Marchant has been here before: dug in, ready for a fight with Athletics Canada, the governing body of her sport, which is supposed to be helping her succeed, not blocking a once-in-a-lifetime opportunity. Leading up to the 2012 Olympics, she came out of nowhere and ran a time of two hours 31 minutes and 50 seconds. It was the closest a Canadian woman had come to qualifying for the marathon since Sylvia Ruegger did so the first time women were allowed to race the distance back in 1984. The Olympic standard for London was 2:37.00, but in Canada, we aren't interested in merely participating – the Olympics is about medals, and Athletics Canada set the qualifying time at 2:29.55. So Marchant, a lawyer by trade, was forced to fight with her own national organization in a legal appeal. And she lost. Marchant's career has come a long way since then. In 2013, she broke Ruegger's 29-year-old Canadian record, running 2:28.00. The next morning, Marchant was on the cover of every newspaper in the country. Since then, she's represented Canada at the world championships, won a Pan Am Games medal and qualified for Rio in both the marathon and the 10,000 metres. Marchant has also become a transcendent figure in running in this country. She's talked candidly about body image and is a role model for runners of all ages. At the national cross-country championships last November, high school kids lined up to take selfies with her. And so did their parents. Marchant is smart and accessible, both as a relatable figure that stands alongside recreational runners at local road races and as an athlete with social media savvy, promoting running beyond the diehard track fans. Running the marathon in Rio has always been Marchant's dream. When forced to choose between training for the marathon and a legal career, Marchant went with her gut and stuck with running. The marathon has a certain type of water-cooler and sponsorship appeal that simply doesn't exist in the 10,000. In early June, Marchant got a phone call from Athletics Canada's head coach, essentially telling her to forget about running the marathon in Rio. Peter Eriksson, who took over the job after a poor performance in London, has a clear objective: to win medals and produce top-12 finishes. The national high-performance organization Own the Podium (OTP) gives Eriksson about half of his total budget ($4.12 million). The expectation is a top-12 finish in the track and field medal count, the same burden OTP places on all sports. No special considerations for a sport as deep and competitive as track and field. It's about results, plain and simple. And that's why Eriksson was calling Marchant, to tell her she wasn't good enough to run the marathon. If we aren't interested in letting our best marathoner try, then what's the point of the Olympics? It may sound like a silly question, but if we stick to the intention of the founder of the Games, most countries, including Canada, have lost their way. The Olympic creed, first stated in 1908 by Olympic movement founder Pierre de Coubertin, proclaims that the reason for the Games "is not the triumph, but the fight; the essential thing is not to have won, but to have fought well." It appears that Canada's Olympic team is not only caught up in the allure of triumph, but also isn't so interested in allowing athletes to merely "fight well." Athletics Canada's spreadsheet anticipates that Marchant will likely do better on the track than in the marathon, and that the latter event is a lost cause. This may be true. At the 2012 Olympics, only 22 runners lined up for the 10,000, whereas 118 ran the marathon. Athletics Canada is compelled to try to game the outcome to keep in good standing with OTP and Sport Canada. If Marchant finishes top 10 in the 10,000, that will look like a success. But a 20th place in marathon would be seen as a step backwards and, from a funding perspective, too risky. It's how OTP functions: it funds the lowest hanging fruit. That's why Canada dumps cash into sports like canoeing, even though it's a far less accessible at the grassroots level than running. Thankfully, only 18 nations had qualified for the 48 canoeing medals up for grabs at the 2012 London Olympics and Canada managed to win three. Marchant wants to do both events she's qualified for, and after proving she's incredibly fit, is in the right to demand that she be allowed to also run the marathon. Each country is allocated three spots in athletics events, and in both the 10,000 and the marathon, Marchant is only one of two runners who made Canada's qualification times. She wouldn't be taking a spot from someone else, so it's a can't-lose situation: she runs all-out in the 10,000 and then sees what she can muster up in the marathon. The worst that can happen is that she does poorly in the latter. And perhaps that's the problem. Athletics Canada seems to be operating in a state of fear. Beyond being motivated purely by hardware, they are equally as fearful of too many blemishes. In their quest for gold, they've become bizarrely risk adverse. Athletics Canada is expected to add to Canada's medal total, or at the very least deliver athletes that produce top-eight finishes – a result that points to a medal in the next Games. At 32, Marchant is seen as too old for future investment, so if she can't produce a podium performance, she hurts Athletics Canada's bottom line. What's sad about all of this is that Athletics Canada and Own the Podium are probably leading this country down the wrong path when it comes to the most lasting impact that sport has in this country. A recent study reveals that participation in sports is at an all-time low, and that children become less interested as the emphasis becomes overly performance based. Denying one of Canada's strongest role models a chance to run in a marquee event at the Olympics sends the wrong message. In the aftermath of these Games, Athletics Canada will get to deal with a legacy it has helped create: a generation of kids disinterested in sport. Sure, if Marchant is allowed to run, she won't win the Olympic marathon. She may not even place in the top 12. But she should be allowed to fight well. And her story of that fight could inspire not only the next woman to break her record, but also thousands more to live healthier lives.